Did you watch the Supernatural season 13 episode 2 where Dean (Jensen Ackles), Castiel (Misha Collins) and Mary (guest star Samantha Smith) had a lead on Sam (Jared Padalecki) and set out to rescue him? 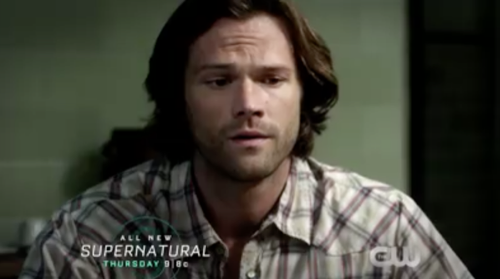 If you missed the episode we have a full and detailed Supernatural recap, right here for you! On tonight’s Supernatural episode as per the CW synopsis, “When a crying baby leads to death in a mysterious abandoned house, Mary (guest star Samantha Smith), Sam (Jared Padelicki) and Dean (Jensen Ackles) decide to investigate. Meanwhile, Castiel’s (Misha Collins) hunt for Lucifer (guest star Rick Springfield) leads him, begrudgingly, to partner up with Crowley (Mark A. Sheppard). Mary Winchester was still feeling out of place and so she had decided to do something that would at least make her feel better even if it didn’t help her readjust. She had decided to cut her hair and the new look truly did fit her. So Mary had thought that her sons wouldn’t mind her hair cut however they took exception to why she cut her hair. She had told them that shorter hair would help her go hunting because that would give the bad guys something less to hold onto. But Sam and Dean didn’t want their mother to go hunting and unfortunately Sam had been the one that was more vocal about it. Sam had thought that they shouldn’t risk their mother in the field and so he’d rather she stay behind. However, Dean was eventually able to come around to the idea because he saw how much their mother wanted to go hunting and knew that they would be with her at all times. So Dean and Mary ended up getting their way and Mary was allowed to work a new case with the boys though this latest one was truly disturbing. A young couple had gone into an abandoned house and they had both died there of hyperthermia despite it having been in sixty-five degrees when they died. And so the Winchesters knew instantly that there was something wrong with the house. Yet, their mother had wanted to go with them to check the place and she did the one thing she wasn’t supposed to. Mary had wandered off on her own to check this creepy little crib in one of the rooms and she was going to dismiss it after a while because there had only been a doll in the crib, but Mary had tried to leave the door had closed her in on its own. So naturally Mary cried out and her sons ran to free her. Only she had a nasty bruise on her arm afterward that showed that something did happen in that room and that had scared Dean and Sam more than anything. The guys had thought that Mary would be safe with them and still they had almost lost her to a killer house. So they had wanted to bench Mary once they had gotten away and there was no one to speak up for her with Castiel gone. Castiel had gone looking for Lucifer and he was even willing to risk hell by doing so. Though enlisting Crowley was probably a step too far. Crowley couldn’t be trusted and his motives were constantly shifting however, Crowley also wanted to find Lucifer just as much as anyone and so it would makes sense that he would want to partner up to do it. And in a perfect world Castiel and Crowley would be able to work together. Only they couldn’t. Both Castiel and Crowley had their reasons for wanting to get Lucifer, but they could barely tolerate each other much less work together. So, really, they were kind of just stuck together and they were making each other lives miserable while Lucifer was out there doing what he wanted and Mary was getting sidelined by her sons. Yet, Mary was her own person and she didn’t take it well when her boys told her to leave the case to them. And so she did some research on the house when her sons weren’t around to tell her to take it easy and she had found out a little bit more about the boy that was hunting the place than either of her sons. Dean and Sam had found out that the little boy that died in the house was Lucas Kellinger yet neither of them had bothered calling Lucas’s mother or even listening to Mary. Mary had told them that she didn’t think the spirit had wanted to harm her and the lost little boy that was using a crib to lure people in had touched a nerve. Mary had remembered seeing Sam in his crib and how he had once been vulnerable as well. However, by calling Lucas’s mother, Mary got to learn that Lucas had once been sweet and never could have hurt anyone. So Mary had later gone to see his spirit on her own without any of her sons around. Dean and Sam had left to salt and burn Lucas’s bones though it didn’t work because they had tried calling their mother afterward and she was talking to Lucas’s spirt when she answered her phone. But Mary’s cell had run into some interference that had cut off her call with her children. So the guys had no other choice than to come after her to see if she was alright and unfortunately she hadn’t been. Mary had been attacked by the real evil spirit in the house and it had possessed her by time the guys arrived. However, there wasn’t much that they could do. The guys couldn’t kill their mother and they didn’t want to hurt her so there had been left with little options, but thankfully some of the real Mary was able to fight off the possession and she had told them to get to the basement. The basement was where the bones were and the bones belonged to this evil dad that had killed several children in the house. So Sam had run off to get to the bones and Lucas’s spirit hadn’t been afraid to help. Lucas had shown Sam the bones in the basement and upstairs Dean managed to chain up his mother until the spirit could exorcised. So Sam and Dean did save their mother and they had also released several of the children that had been stuck there, but Mary had saw in the dad’s soul and that had made her realize what was wrong. Mary had seen that the dad had lost his daughter and had then killed the other children because he had coveted them so that had reminded Mary of what she lost. She misses John and she was mourning her sons. Realistically, she knew that she still had Sam and Dean yet she didn’t see them grow up and had remembered her sons as being babies when she died. And so Mary broke some difficult news to her sons. Mary had told them that she needed to go away for her a while in order to find herself again and, regardless of her intention, that had hurt both Sam and Dean.